Ractopamine is banned in 160 nations including Europe because it is responsible for hyperactivity and muscle breakdown in pigs, and a 10% increase in their mortality rate. 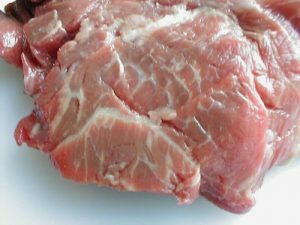 It was banned in China after more than 1700 people were “poisoned” from eating American pigs that had been given ractopamine. The drug bears the warning label, “Not for use in humans. Individuals with cardiovascular disease should exercise special caution to avoid exposure. Use protective clothing, impervious gloves, protective eye wear, and a NIOSH-approved dust mask’’—yet somehow it is considered safe in human food. How is this possible? Most of the world’s developed countries ban, or have at least placed limits on, genetically modified organisms. The European Union and its member states, as well as Switzerland, Norway, Australia, New Zealand, Thailand, the Philippines, Saudi Arabia, Egypt, Algeria, Brazil, and Paraguay all have restrictions or outright bans on the use or importation of genetically engineered seeds, plants, or foods. A detailed map with the specific products banned in Europe is available here. This is one reason the California Right to Know 2012 Ballot Initiative is so important. If California requires labeling products containing GMOs, it will be difficult for most manufacturers to create separate labels for their products sold in other states, so the labeling will become national. This is why we are trying to help the Right to Know Campaign raise one million dollars to drop a “money bomb” on Monsanto—to combat the anti-GMO propaganda and get this proposition passed in November. If you haven’t done so already, please make a donation to the Right to Know Campaign—and please give generously!